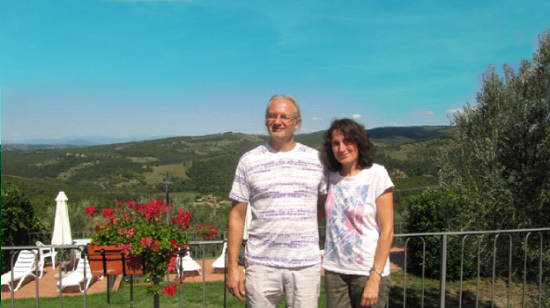 We are Franco and Silvia, with our daughters we live in Borgo Sicelle, we are "welcoming by nature" and we always guarantee to our guests our constant presence, with the appropriate discretion. 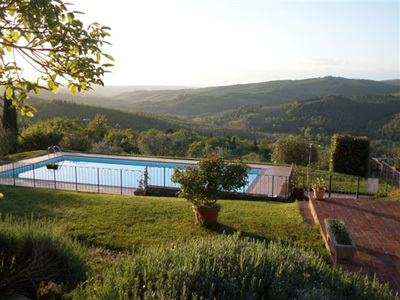 ...and at the end of the day enjoy a swim in the pool with a beautiful view or chill out on the panoramic terrace of Borgo Sicelle, drinking a good Chianti, admiring a beautiful sunset. Florence (27 km), Siena (35 km), San Gimignano (25 km), Volterra (50 km), Pisa (90 km), Arezzo (100 km), Lucca (110 km) These all are very easy to get. We are in the Chianti Classico: Castellina in Chianti, Panzano in Chianti, Greve in Chianti, Radda in Chianti, Gaiole in Chianti, a group of small villages, marvellous villages, wonderful valleys of vineyards, olive groves and woods, lovely to see! We can book for you a visit to the museum, even before your arrival or when you will be in Borgo Sicelle. Are you planning visits to museums by yourself? Would you like to take part in a cooking class? Or have a professional chef who cooks for you? There's no place like Tuscany for tasting and learning good Italian cuisine, appreciated all over the world for its authenticity, purity and its healthy aspects. Borgo Sicelle, in collaboration with Chef Mattisse, offers the opportunity to book funny and / or educational cooking classes or cosy dinners with your friends. Why not trying to cook the famous Florentine Steak? We have 3 barbecue (2 charcoal and one gas) available for all customers. There are excellent butchers (some famous) in the area, with production of artisan meats. Do you want to organize a group holiday? There is the possibility to cook and eat all together. We have a professional kitchen that we can rent; there is an adjacent covered terrace, where to eat, overlooking the hills. 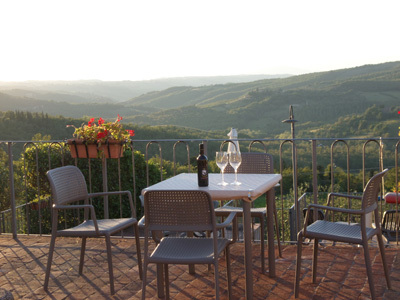 We can suggest visits and tastings in the farms / castles of the Chianti Classico, some with lunch. Also just 5 minutes from Borgo Sicelle. Taste the Tuscan cuisine in the many restaurants in the area. The closest is in front of the structure, accessible on foot (crossing the road, 20 meters). We will give you the list of weekly markets, shops and supermarkets in the area. In Borgo Sicelle there is a 50 sqm room with table tennis and table football available to all customers. Some demanding routes start from Borgo Sicelle. The famous "Via Francigena" is 20 minutes by car. In 20 minutes it is possible to reach a farm where Cristina will welcome you with her pets www.onoterapia.eu. Are you lovers of contemporary art and nature? A day at the spa? Where to find the best Outlets? A ride on a Vespa or with the legendary Fiat 500? What about flying in Hot Air Balloon in Chianti?